The Wendell Gilley Museum in Southwest Harbor, Maine is the finest of the few museums dedicated to the art of bird carving. Originally begun as a collection of the works of it's namesake, a native of Southwest Harbor and one of the pioneers of American bird carving, the museum has expanded to include the works of other artists and offers workshops taught by their carver-in-residence. I talked with Nina Gormley, the Executive Director and Curator of the museum, about Wendell Gilley and the world of bird carving. How did the Wendell Gilley Museum start? NG: Wendell Gilley’s wife, Addie, collected 110 examples of her husband’s work from 1931-1981. The couple had thought of starting a museum on their own eventually, but realized that they were no longer up to even the 100+ visitors that came to the home/ workshop with no advertising. Happily, many other people felt that a museum should be established to ensure that future generations could enjoy Wendell’s unique cultural legacy. In 1979, Steven Rockefeller spearheaded efforts to incorporate the Wendell Gilley Museum, set up a board and raise funds to build it. The Museum purchased the Gilley’s collection as the core of its permanent collection. Roc Caivano was chosen as the architect and engaged to design a building that would not only showcase the bird carvings and other art exhibitions, but serve as a model of energy efficiency and environmental awareness. Most of the crew that built the Museum had worked with Wendell Gilley when he was a plumber. He was well-liked and respected and their workmanship on the building reflects their admiration. The building opened to the public in July of 1981 and the Museum has been welcoming visitors to discover art through nature and vice versa ever since. What drew Wendell Gilley to start carving birds over other subjects? NG: He had a passion for bird hunting. His Yankee spirit made him feel badly about using only the meat and tossing the skins, so he took up taxidermy to learn how to “stuff them and save them.” When he went to the Boston Museum of Natural History in 1931 to look at the taxidermy exhibits, he was drawn to a display of miniature bird carvings by Elmer Crowell. When he got home, he whittle out a little mallard drake, enjoyed it and the rest is history. His taxidermy mounts became his models. Aside from Mr. Gilley, who are some other famous names in the world of bird carving - past and present? NG: Besides Wendell Gilley’s inspiration, A. Elmer Crowell, the first bird carving pioneers that spring to my mind are Charles “Shang” Wheeler, Lem and Steve Ward, Arnold Melbye, Grainger McKoy, Ernest Muehlmatt, Harold Haertel, and Bruce Burk. There are so many styles and so many great carvers these days, it’s tough to give a short list, but my favorite contemporary carvers known on the competitive scene are Larry Barth and John T. Sharp and Todd Wohlt. He does not enter competitions, but the Gilley Museum’s Carver-in-Residence, Steven Valleau, is on my short-list for his outstanding, graceful work and his enduring patience with students of all ages. Do most bird carvers work toward realistic depiction of their subjects or are there different styles as in painting? NG: There are many different styles. 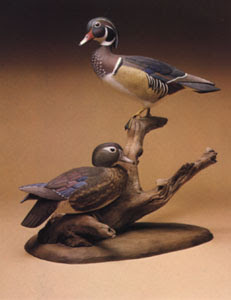 Some carvers, for example, do not even use paint, such as John T. Sharp, whose “interpretive” style depicts birds (and other subjects) in hardwoods such as black walnut with an oil finish. The grain of the wood is integral to the design. Speaking of such carvers, I neglected to mention John’s mentor and one of the foremost early interpretive style carvers, Maine’s own Charles “Chippy” Greenough Chase. Among the carvers who paint their subjects, some create “smoothies” in which all the detail is painted on, others carve, burn and/or stone in texture to their pieces before painting. Some go for a more “folk art” look, others strive to make the birds look as if they will take off any minute. Are certain styles more desirable to collectors than others? NG: If price is a measurement of “desirable,” classic antique decoys still rule the market, some fetching prices in excess of $800,000, but there are collectors for every style – and price range of carvings. $800,000! What kind of decoy was that? What place to duck decoys have in the history of bird carving? NG: A black-bellied plover by A. Elmer Crowell went for $830,000; there may have been higher prices since that 2006 sale. Decoys makers turned to decorative carving when conservation laws banned market gunning in 1918 and cut down on the need for working birds. Because of the decoy connection, are ducks and shorebirds still the most commonly carved birds? Do collectors prefer some species to others? NG: Ducks and shorebirds, i.e. the birds decoy makers and hunters were most familiar with started out as the most commonly-carved birds and still appear to have an edge, but others, including exotic species are catching up as carvers diversify and the collecting world fills with birders as well as hunters. Collectors tend to favor game birds and good-looking birds. A carver can be sure to sell more loons than vultures. Not a huge market for vulture sculptures, eh? Makes sense. Are some of these uglier birds gaining any more respect as the ranks of birders, as opposed to hunters, rise? Are there other ramifications from the recent growth of birding? NG: Perhaps birds that are both rare and “ugly” are gaining respect with the increased interest in birding. I have seen the combination of birders who like to travel, who see something “special,” a quetzal, for example, then look for a carving or commission one to savor the memory. Back to Wendell Gilley, did he focus on carving the birds he hunted or did he experiment with other species? Did he have a favorite subject? NG: Wendell’s favorites were the birds he had the most first-hand experience with—those he hunted, and Maine’s ever-present State bird, the black-capped chickadee. If you pick up a Gilley green-winged teal or a ruffed grouse, you almost feel it’s alive; it’s obvious that Wendell handled those, whereas his Adele penguin leaves something to be desired. What do you see for the future of the Wendell Gilley Museum, and for bird-carving in general? NG: Wendell Gilley believed that all people have some form of “creative power” that they simply need to find the outlet for. Here at the Museum and elsewhere, more and more people of all ages are finding that bird carving is a great outlet for that power and also a great way to connect with nature. We will do our best here to keep fostering the connection between humans, art and nature. After you have carved and painted a Blackburnian Warbler you will never fail to recognize a real one in the field. I believe that bird carving and collecting is going to continue to grow and diversify. Whether you carve ornaments for your family or commissions for celebrities, whether you buy $12.00 carved chickadees or $830,000 decoys, there is a place for everyone in the bird carving continuum. Very informative and well-written article on America's unique art form! A very well written and informative article on America's unique art form.